We all know the consequences of the current solutions to protecting your boxed merchandise. Locked in cases, out in the open, mangled cables, thousands of payroll hours lost, frustrated cashiers, and the merchants screaming about aesthetics. 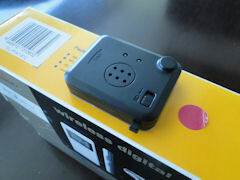 We invite you to see the future of EAS box tagging this week; the Ninja Tag. Combining advanced technology and aesthetics, the Ninja's sleek rectangular body bonds to any box surface. Once armed, the Ninja becomes a robust security device, capable of detecting tampering efforts with self-alarming capabilities. For those retailers who seek a little extra oomph in their EAS, the Ninja can be enhanced with WG-patented IR technology for a crucial extra layer of protection that stops even ORC professionals from removing the tag without alarming. The Ninja is compatible with all AM EAS systems, and is available in RF and RFID technology! But don't take our word for it! Watch our video here. This revolutionary product is sure to make an impression. Don't miss out on your EAS future.